In order to interact with the world we need senses. As humans we have five senses to help us get around and experience the world. The Raspberry Fly is no different. It too needs senses to get around safely and for that purpose it uses flight instruments to collect real world data. It would be theoretically correct, but because of the accumulating error our estimate of the drones pitch, roll and yaw after 30 seconds would be so far off it would crash. So while the gyroscope will be quite precise in small time intervals (less than a second), it will be useless for sustained flight if we can't counteract the accumulating error. Enter the accelerometer. The accelerometer measures acceleration, and since we are on Earth it will be under the influence of Earth's gravitational field. When lying at rest it will measure an acceleration of 1G in the direction of Earth's center. 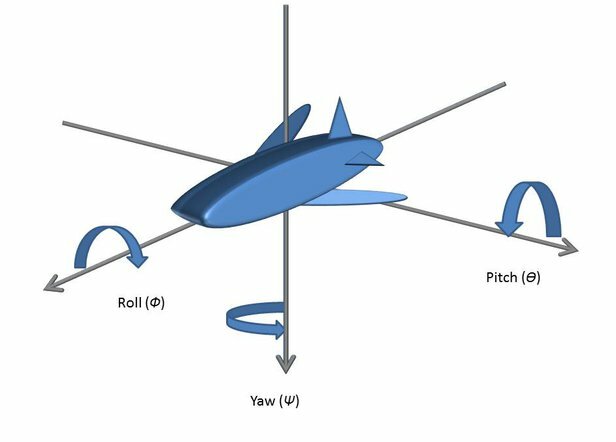 The accelerometer returns the measurement in X, Y and Z components (the three orthogonal axis in a 3D coordinate system), and from this information we can calculate an estimation of pitch and roll. where phi is angle of roll, theta is angle of pitch and psi is angle of yaw. Now this might be a good time to read up on matrices and especially matrix multiplication if you feel a little rusty. 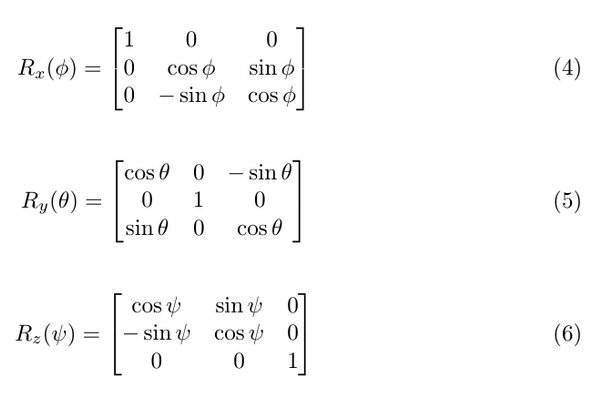 Remember that matrix multiplication is associative but NOT commutative. Where G is the output vector from the accelerometer. This was just a quick explanation based on the rotation sequence from equation (7). I highly recommend grabbing pen and paper and working your way through the excellent AN3461 application note from Freescale Semiconductors. This is called a tilt-compensated heading because it derotates the pitch and roll angles in order to get the correct yaw angle. So now we have yaw right? Well kind of. Once again we have assumed a near perfect scenario where no other magnetic fields than the Earth's are present. However such a scenario is unlikely and the accuracy of our calculated yaw is influenced by magnetic fields in the vicinity of the drone. The unwanted effects are divided into hard-iron and soft-iron effects. Hard-iron effects are those that are constant regardless of orientation. They contribute a constant additive field to the Earth's magnetic field and that makes them relatively easy to compensate for. Soft-iron effects are not constant additive fields, but rather distortions to existing fields. They depend on orientation and are not as easy to compensate. Fortunately it will often be enough to compensate for hard-iron effects to get a reasonably good yaw estimate (The Raspberry Fly only use hard-iron compensation). The data is slightly elliptical (soft-iron effect), but good enough for my use. The center can be found by using software to fit the data to a circle and then used for hard-iron compensation. 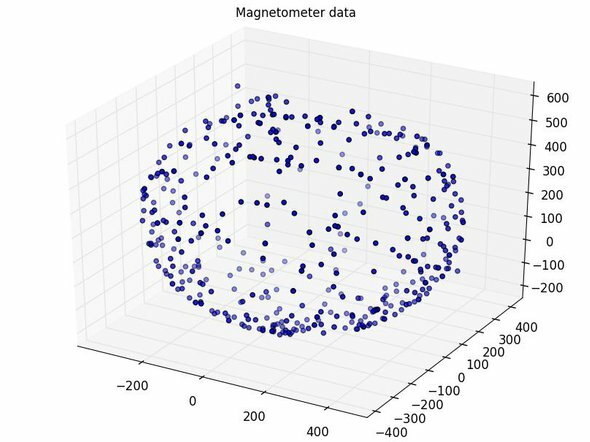 For more information on using the magnetometer to estimate yaw i highly recommend another great application note from Freescale Semiconductors (AN4248). Once again grab pen and paper and work your way through it. If we look at roll (equation 12), then phi is the current estimate of roll, delta phi is gyroscope output for roll (rate of change), delta t is control loop period (reciprocal of control loop frequency) and phiacc is accelerometer output for roll (absolute). p is a variable that determines how to combine the data from the gyroscope and the accelerometer. A value of 0.95 (a good start) will rely 95% on the gyroscope and 5% on the accelerometer. This preserves the high short term precision of gyroscope data while preventing the drift from long term accumulating errors by using Earth's gravitational field as an external reference through the accelerometer data. So do we have to go and buy a gyroscope, an accelerometer and a magnetometer? Yes and no. Fortunately these instruments are available as Inertial Measurement Units (IMU). These are small breakout boards with a gyroscope, an accelerometer and sometimes a magnetometer. Just what we need! These can usually be communicated with on an I2C-bus so getting readings are quite easy using a Raspberry Pi. The Raspberry Fly uses an AltIMU10-v3 with 10 Degrees of Freedom (DOF). 3 degrees from the gyroscope, 3 degrees from the accelerometer, 3 degrees from the magnetometer and 1 degree from the barometer. Just a few notes before rounding up the Flight Instruments section. When going through all the calculations there is plenty of opportunity for small mistakes that will result in a lot debugging frustrations. Be absolutely sure that instrument axis are aligned on the IMU and keep a close eye on which way the positive axis are pointing. The IMU should have axis printed on it for reference, and the calculations depend on the axis orientations in relations to each other. So when absolutely sure about where all instrument axis are located go through the calculation to make sure that no axis need to be swapped around. If you are anything like me, this is the point in the process where you look slighty insane trying to visualize all the axis with your fingers.